There were 17 of us folks at BIW this morning for the weekly Lenten vigil. These vigils will continue for the next three Saturdays. It was cold with cloudy skies and quite windy as it often is along the Kennebec River that runs through Bath. We had our usual BIW security man following us as we moved from the administration building to the South gate where workers stream out when the noon horn blows. I had one (thoughtful?) offer of a bag of chips if I wanted to eat. Also one young guy gave me a kind word. Most workers looked at my sign - some smiling, others grimacing, many showing no emotion at all. Truth is I am hungry all the time - stomach growls. But I just shrug it off - did the same when I quit smoking on my son Julian's first day of school. He came home and told me that he had watched a movie about what smoking does to your lungs. I knew in that moment I had to get real. I handed him my cigarettes and said go throw them in the garbage. Other than a handful of Cuban cigars I bought while in that country back in the 1990's - I've not smoked since then - excepting pot. Like when I quit smoking, whenever I get real hungry, I just tell myself to move on in my mind. And before I know it I am thinking about something else much more interesting. My energy level still is fairly strong - I've been working long hours - but yesterday I hit the wall and had to rest more than before. Today feels like it will be the same. I've got a ride worked out with Regis Tremblay to get to Augusta on Tuesday at 9:30 am where I will stand with my sign on the capital's 3rd floor hallway between the House and Senate chambers. Regis is working on a new video about the crumbling human and physical infrastructure of Maine at the same time that GD is demanding $60 million from our financially desperate state. 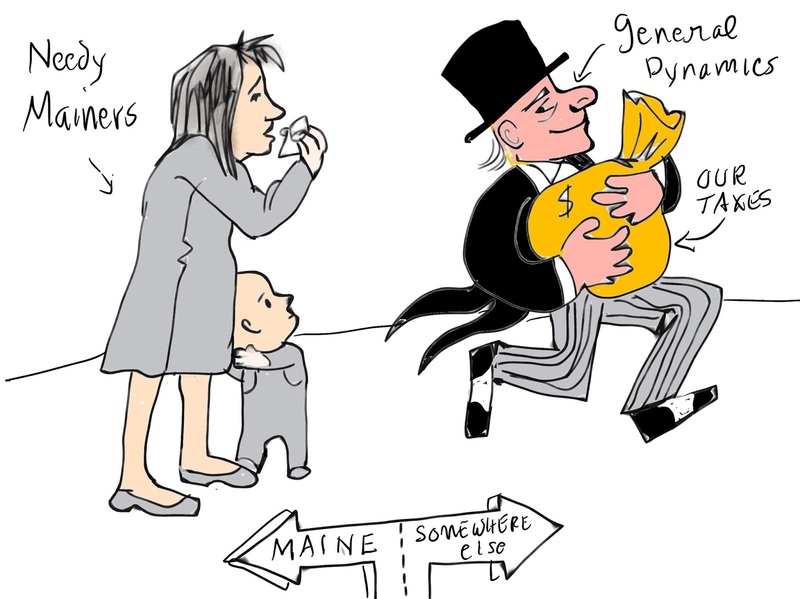 GD has already taken more than $200 million from Maine since 1997. They've also recently taken about $20 million from Rhode Island and are currently pushing hard to take $150 million from broken Connecticut. GD has operations all over the world and is exploiting workers and communities everywhere they go. This is the corporate ethic of our age - wage war to control resources for production, produce a lousy product, extract as much as possible from labor, destroy the environment, demand tax breaks from the local communities that the 'corporate entity' graces with its mere presence. Democracy has been drowned by the corporate agenda. Our survival is at stake. We might not win the struggle on this particular, or another, issue but I feel I must fight as long as I can draw breathe. My son's future is at stake, all life on the planet in some way is at risk. What could be more important in this moment than to give one's energy towards ensuring the survival of the people. Nothing brings me more joy. But, after looking into each of these claims, I can’t say I disagree. I’ll start with the Bath Police Department, which Gagnon accuses of being “outsourced” to a corporate entity. In this instance, Gagnon’s allegation is backed up by a pretty credible source: a state Superior Court justice. Last month, judge Daniel Billings acquitted Gagnon and eight other defendants arrested and charged last April after staging a protest at a Bath Iron Works “christening” ceremony for a newly constructed warship. “Here, the testimony is basically the police department is outsourced to BIW on these events,” Billings said in his decision, which was videotaped by activist Regis Tremblay and posted on YouTube. As Billings saw it, Bath Lieutenant Robert Savary was “taking his direction” from the company’s security personnel and “arrests were going to be made or not based upon” the discretion of Bath Iron Works. The justice, who was appointed by Republican Gov. Paul LePage, went on, criticizing the city for its lack of clear rules on how it polices protests. Billings seemed to go as far as to suggest city officials were leaving themselves vulnerable to a lawsuit. When I contacted two members of the Bath City Council, I didn’t get the sense they were taking the word of a sitting judge too seriously. These responses, frankly, struck me as ludicrous. Are they trying to argue the city council has no say over its police department’s policies? If the council doesn’t “give instruction,” then who does? Does the police chief have impunity? 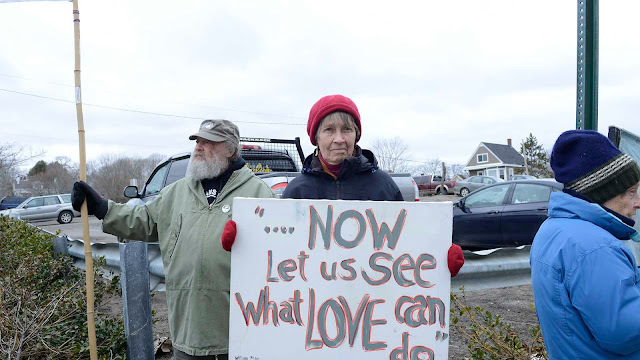 Has martial law been declared in Bath, Maine? Eosco and Ambrosino both claimed there are conflicting accounts of Justice Billings’ ruling. But his comments seemed pretty unequivocal to me. They can also be viewed by anyone with an Internet connection and the time to sit through a 12-minute video that does not appear to be significantly edited. Even if Justice Billings’ ruling was ambiguous, is it really that difficult for city council members to get a copy of the transcript from that day or set up a meeting with Billings to get some clarification? My instinct is Ambrosino and Eosco are less confused than they are uninterested. Bath Chief of Police Michael Field and Lieutenant Savary did not respond to my requests for comment on this subject. She said, “They’re actively subverting the Constitution in favor of the private entity’s interest. Gagnon’s second example of an entity being “outsourced” to BIW is The Times Record newspaper of Brunswick. For three years now, the group PeaceWorks has had a regular column in the paper. 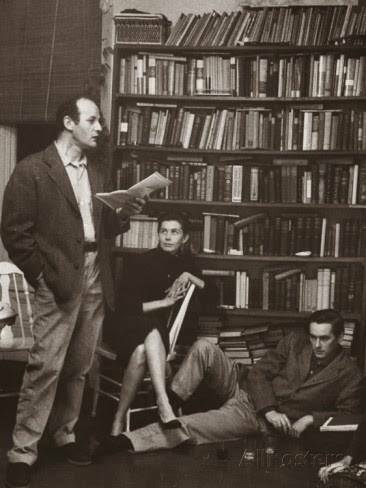 Activists rotate as authors and educate readers on the concerns of the local peace movement on a twice-monthly basis. But, as debate over the proposed 20-year, $60-million tax break heated up at the capitol in Augusta and opponents placed dozens of letters to the editor and op-eds in newspapers across the state, The Times Record began applying considerable scrutiny to the PeaceWorks column. Gagnon’s reference to conversations he had outside the BIW shipyard with unnamed workers not in favor of the tax bill. “I’m afraid we’re going into hearsay territory with this,” Swinconeck wrote in an email to a PeaceWorks member that Gagnon later sent around to supporters. The use of a statistic saying 43,000 children in Maine live in poverty. “[W]here did that number come from?” Swinconeck wrote. Gagnon’s suggestion that proponents of the tax deal have claimed BIW officials “might have to shut their doors and move” if the company doesn’t get a tax break. “Does he have a source for this?” the editor wrote. After reading Swinconeck’s comments and Gagnon’s piece, I got the sense Swinconeck did not come to the editing process with fair intentions. Yes, it’s always better to have all names cited in an article. But, because Gagnon is the author and the person who spoke directly to the workers, I can’t help but wonder if Swinconeck is really concerned or if he’s just looking for any red flag. Gagnon’s articles have appeared many times in numerous publications, and all indications are he is an honest writer and not a fabricator. I also can’t help but see a double standard here. If BIW General Counsel Jon Fitzgerald, who’s been the public face of the company’s tax credit campaign, told lawmakers the company’s workers support the bill, would The Times Record call that hearsay and ban it from its pages? I doubt it. Also, consider this: BIW brass have claimed bidding for Navy contracts between the Maine shipyard and Mississippi-based Ingalls Shipbuilding is more competitive today than ever before. But has that claim been seriously examined by journalists? After following this story closely in local media, I’ve not seen evidence that a single reporter has called up a Navy procurement official for some context. So is the very crux of BIW’s case mere hearsay? The 43,000 figure concerning the number of children in Maine living in poverty comes from the KIDS COUNT data center, a project of the Annie E. Casey Foundation. It covers the year 2016, and it’s easy to find online. Swinconeck’s suggestion that BIW hasn’t said it could leave Maine if it doesn’t receive a tax break is another example of the editor stretching a reasonable interpretation in order to find a point of contention. While it’s possible no one has explicitly said this in a public meeting, BIW officials have employed fear tactics and more than implied uncertainty would likely follow if the company did not receive a tax deal. Furthermore: emails between Rep. Jennifer DeChant (D-Bath), the bill’s sponsor, and Jon Fitzgerald, the BIW lawyer, obtained through a Maine Freedom of Access Act request show the two discussed the prospect of a shipyard closure when determining their “talking points” to counter pushback from activists. Lastly, Swinconeck clearly insults Gagnon when he questions the validity of the activist’s hunger strike. Gagnon has said he is subsisting on water, juices, and broth, which is common practice for someone on a hunger strike. To intimate he’s some kind of fake is a low blow. It’s true that The Times Record has published well reported news articles by Nathan Strout that did strive for balance on the BIW debate, and it has run opinion pieces from activists. But “the optics,” as pundits like to say, look bad when a newspaper editor pulls the plug on an ongoing column by a prominent peace group in the middle of what’s arguably the most heated debate in Maine in years on a topic central to the cause of those activists. The great irony is that, in the end, the Bangor Daily News, a paper with a much larger circulation, published Gagnon’s column. Bruce Gagnon’s argument is incontrovertible when it comes to the Maine legislature and specifically Rep. Jennifer DeChant, who is sponsoring the proposal to award $60-million in tax credits to Bath Iron Works. Emails turned over by the state show undeniable collaboration between DeChant and BIW General Counsel Jon Fitzgerald in hopes of countering the rising tide of resistance to their bill. DeChant sought county-specific employment figures from BIW, including numbers for regions represented by two key lawmakers. DeChant even included the last names of these officials in her request to BIW. DeChant and Fitzgerald also discussed how to use BIW’s competitor, Ingalls Shipbuilding, and the subsidies it receives from Mississippi taxpayers as a lever to sway public opinion. There is also every reason to believe DeChant allowed the company to write the bill on its own behalf. 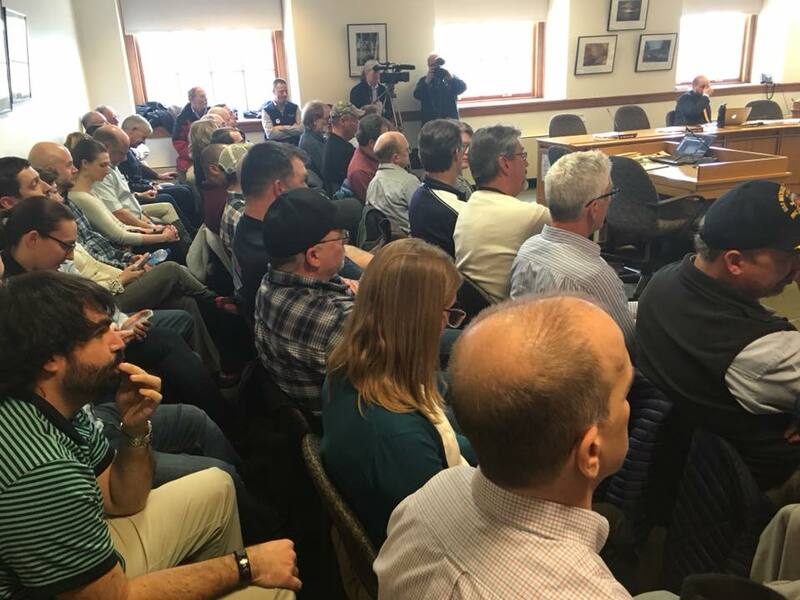 DeChant was so willing to let Bath Iron Works take the lead that a consultant for the company, Daniel Walker of Preti Flaherty, offered to deliver a draft of the legislation to state officials for her. 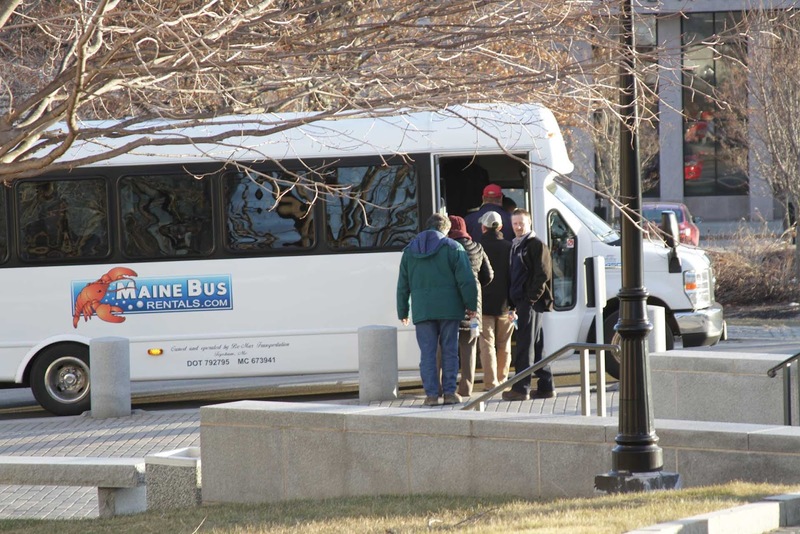 When I spoke to Bruce Gagnon by phone earlier this week, he seemed to have resigned himself to the fact that the Maine legislature and governor will approve LD1781, handing over $60-million over 20 years to BIW. This week, legislators on the bicameral Taxation Committee voted eight to two in favor of the bill, clearing a “key hurdle,” as the Bangor Daily News put it, and sending the legislation on to the full legislature. But, even if the bill ultimately becomes law, I still think Gagnon and other activists are victors here. In the last three months, they’ve proven their case. Bath Iron Works and General Dynamics never did that. The activists have undeniably changed public opinion, and the company is on the defensive. Jon Fitzgerald, Jennifer DeChant, and others didn’t have an answer when activists pointed out the grotesque amount General Dynamics has spent buying back its own stock on the open market in recent years, inflating its share price and likely enriching its top executives. When General Dynamics acquired Bath Iron Works in 1995, the company spent $0 on share repurchases that year. In 1997, when BIW was awarded $194-million in tax breaks by Maine and the city of Bath, it spent $60-million, according to the UMass Lowell Center for Industrial Competitiveness. Last year, it dedicated $1.5-billion to buybacks, the company announced in its most recent quarterly earnings call, and only around $200-million to employee pensions. Since 2013, the year current CEO Phebe Novakovic became head of the company, General Dynamics has spent nearly $11-billion on stock buybacks. Fitzgerald never wanted to address any of this, and the emails disclosed by the state of Maine show it. “I am not going to oblige [Gagnon] and debate this with him on his terms,” Fitzgerald told DeChant in an email late last year. Fitzgerald is smart. He knew better than to get into an argument he couldn’t win. ~ Alex Nunes is the journalist in Rhode Island that broke the General Dynamics stock buy backs story in the Providence Journal. He also writes a blog called Nunes' Weekly. It's snowing here - hard - likely getting 15 inches or more. The ground is not frozen. Just days ago Maine had a big wind and rain storm with sea surges along the shore and some of the expensive houses in southern Maine got flooded. 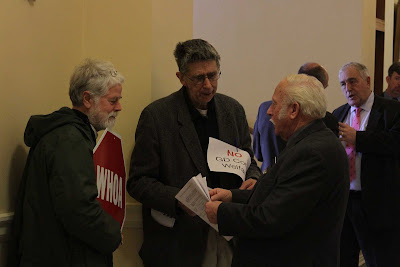 One of the legislators from that area talked with a few of us in Augusta on Tuesday while we were chilling in the hallway outside the closed doors of the Taxation Committee meeting. Peter Morgan suggested to the legislator that it might be time for folks living on the water to move. The big storm is coming. She seemed stunned at first - maybe annoyed at the inference - but also by the notion of big changes coming that cannot be corrected by a state appropriation. 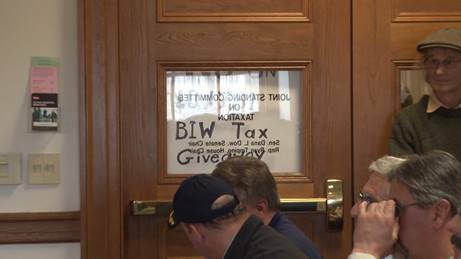 BIW workers filled all the seats in the Taxation committee room long before the meeting began. We took it as a compliment. I was impressed that one worker gave up his seat and sat in the overflow room with our folks - or maybe he was on recon duty. MB, Jason and I shoveled snow today. They did more than I did as my stamina is down but I loved the exercise and being out-of-doors. 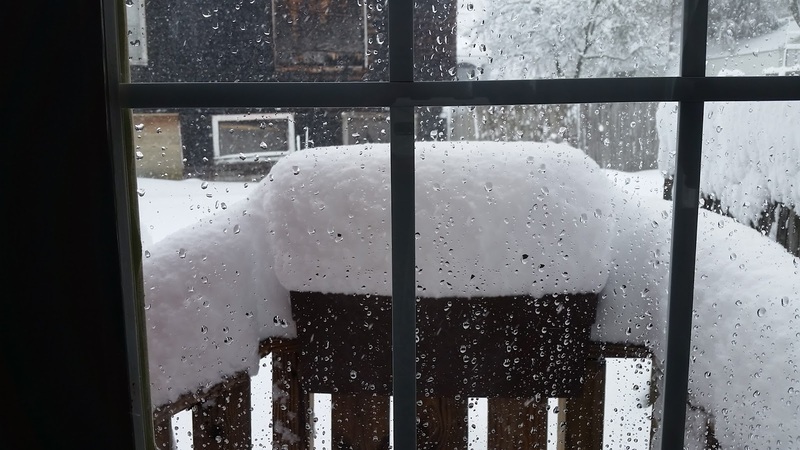 While lifting the wet and heavy snow I was thinking about the GD corporate welfare campaign. More people are getting involved - for various reasons - and we deeply appreciate their excellent contributions. They are part of this movement - maybe call it 'The Life Team - for the children's future'. Is it OK to say you are having fun - even when you are on a hunger strike? It's not bad to show our passion and our human side - our humor. We are not in the business to make enemies - but we are not shirking from calling it like we see it either. If it was good enough for Howard Cosell then it should be good enough for us. A friend advised yesterday that we should stay on course - full speed ahead. Also suggested that we keep asking state legislators this question publicly as often as possible: If you did not run for office fully committed to vote against bills that you admit are bad - then why are you still in office? Climate change means changing weather and we surely have that in Maine. This reality calls on us to have immediate and serious shifts everywhere if we wish to survive. The Titanic is sinking and we can't keep playing the same BS games with the public purse. We need that money to deal with the storm that is upon us. This is not the time for anyone to hide their head and remain silent. A multinational corporation taking huge sums of money from taxpayers should not be paying workers starvation wages. We stand with the workers who are fighting back against low wages and wage theft. It is all part of the larger strategy to militarize the industrial west and turn it into the armed wing of corporate capital as they prepare for endless war in order to control the planet's declining resource supply. Very cynical, evil and wrong-headed. Brian Leonard in Portland last weekend recorded an interview between Bob Klotz and myself on LD 1781 for Portland Public access TV. Many thanks to Brian for the excellent illustrations in the video. My Op-Ed to the Times Record newspaper in Brunswick was rejected by the editor. I covered all that in this blog post. It was to run in a twice a month column that our local peace group PeaceWorks has had for the past three years. A bunch of us took turns writing for it. During the past year the editor cracked down and would not let us write about issues outside the local area (like Jeju Island or Okinawa). I am writing to let you know that The Times Record will no longer be running the Peaceworks column. I've been ruminating on this for a couple of months, and I no longer feel as though Peaceworks' interests and agenda are compatible with The Times Record's mission. 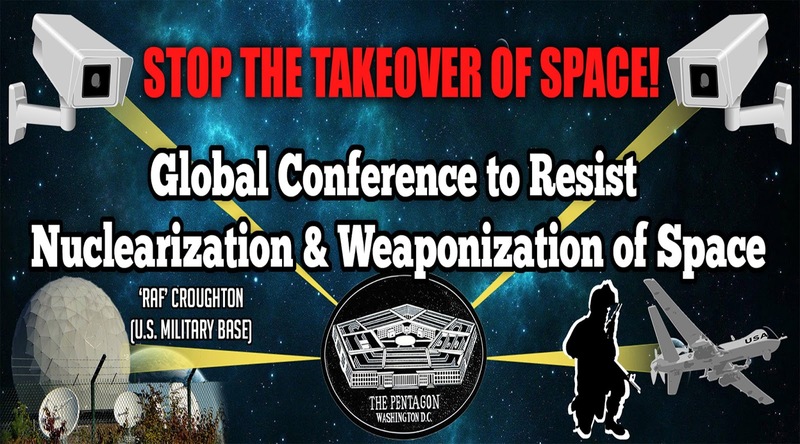 Finally, please note that I do not appreciate Mr. Gagnon sharing our correspondence on his blog, and then having that specific blog post shared on Peaceworks' Facebook page. So after folks heard about my Op-Ed rejection at the Times Record a couple people emailed me and told me I should share it with the Bangor Daily News (BDN). I was in a fit of emotion and just wanted to scream but went ahead and called the BDN editorial department and they said, sure send it up and we will look at it. From there it was assigned to an assistant who contacted me with a couple questions and requested my sources on two items. I gave him the information and now it is online and will be in print on Thursday. Here is a very slightly revised version of the original piece. 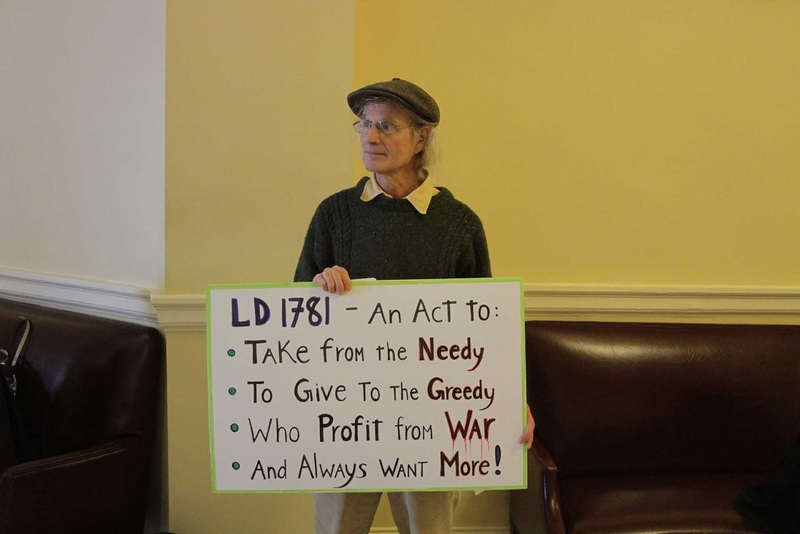 The Maine Legislature is considering LD 1781, a $60 million corporate tax break giveaway to General Dynamics, owner of Bath Iron Works. The bill will soon go to the House and Senate for a final vote. Now is the time for Mainers to speak out. It’s been interesting to watch legislators who complained about Sen. Susan Collins supporting the Trump tax bill turn around and support a similar bill (on a lesser scale) in Augusta. And politicians wonder why citizens have become so cynical and many have given up on politics. The idea of truth, fairness and justice seem to get squeezed out of the process in Augusta just like in Washington. 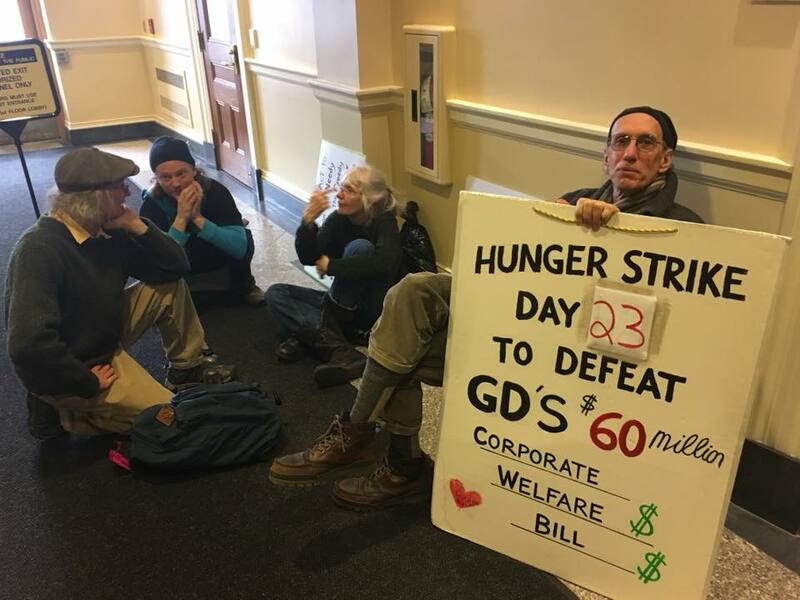 I’ve been on a hunger strike against LD 1781 since Feb. 12, and now about 30 others around Maine have joined by fasting for days at a time. During this period, I’ve been going down to the Bath shipyard during shift change to stand with a sign and hand out flyers. I’ve had some very interesting conversations with workers. Some workers I met are not in favor of this corporate welfare bill for General Dynamics. Two told me they were angry about the last contract that froze wages and forced givebacks in health and pension benefits. Other workers talked about General Dynamics’ stock buybacks — from 2009 to 2017 the company bought back $14.4 billion of its own stocks — driving up market share. Buybacks benefit corporate executives like General Dynamics’ CEO, who made $21 million in 2016. It’s been rewarding to watch the level of interest and activity across Maine around this bill. There have been more than 80 letters to the editor by opponents published in 20 Maine media outlets. People really do care about how their tax dollars are spent in Augusta. General Dynamics often plays the fear card, making veiled threats that the Bath shipyard might not be able to remain competitive if they don’t get this $60 million, the implication being that they would be forced to downsize or even close. We heard these words in 2013 when BIW asked the city of Bath for another tax break. (After pressure from residents, the City Council cut the request in half.) BIW is a money making operation for General Dynamics, and the backlog of ships continues to grow. One important thing we’ve learned during the debate over LD 1781 is that when General Dynamics signs a contract to build ships in Bath most of its costs — worker training, equipment, materials, wages, utilities — are covered by the taxpayer-funded Navy budget. We also learned that General Dynamics’ taxes owed to Maine can be reimbursed by the federal taxpayers under the contract. It is the job of the federal government to pay for the national defense. It is not the job of state and local governments to cover those expenses. 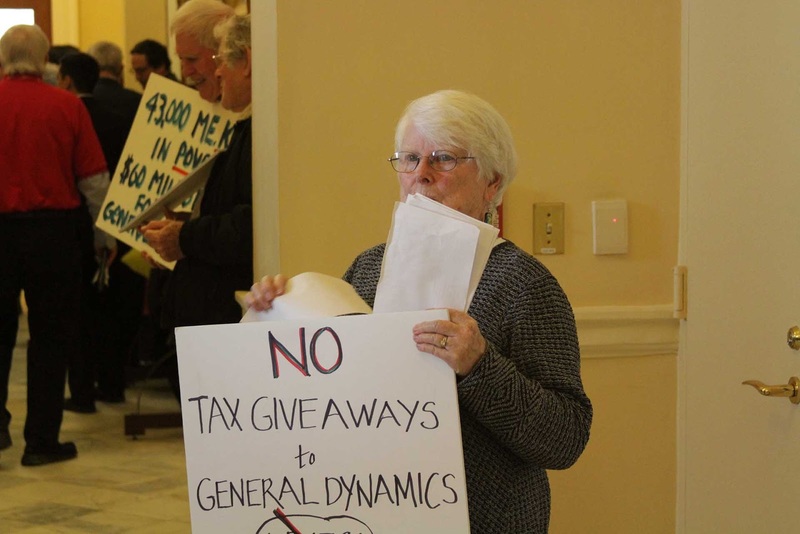 But corporations like General Dynamics have upped the pressure on states like Maine (and Connecticut, where General Dynamics is demanding $150 million) and cities like Bath that are hit up for tax breaks. 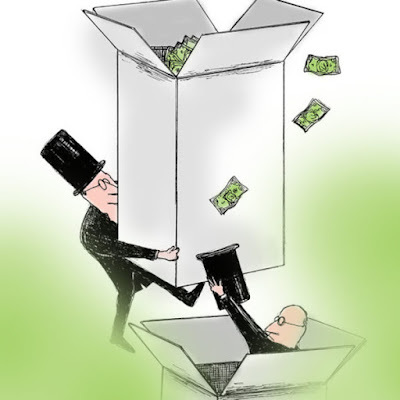 Corporations are in business for one thing, and that is to make maximum profit. They don’t care where they get it as long as they succeed. But the role of government should be to strike a balance to ensure all the needs of the people are met. In order to pay for those needs, government must ensure that tax dollars are properly spent to do the most good. LD 1781 violates that mandate to do good. The public should be alarmed about this corporate welfare bill. Most conservatives complain about welfare for poor people but remain largely silent about tax dollars given to the corporate class. Generally, liberals oppose corporate welfare, but sadly many legislative Democrats support LD 1781. Many legislators have put the demands of General Dynamics above the needs of those who presently suffer from poverty and neglect in Maine. To me, that is a real tragedy. 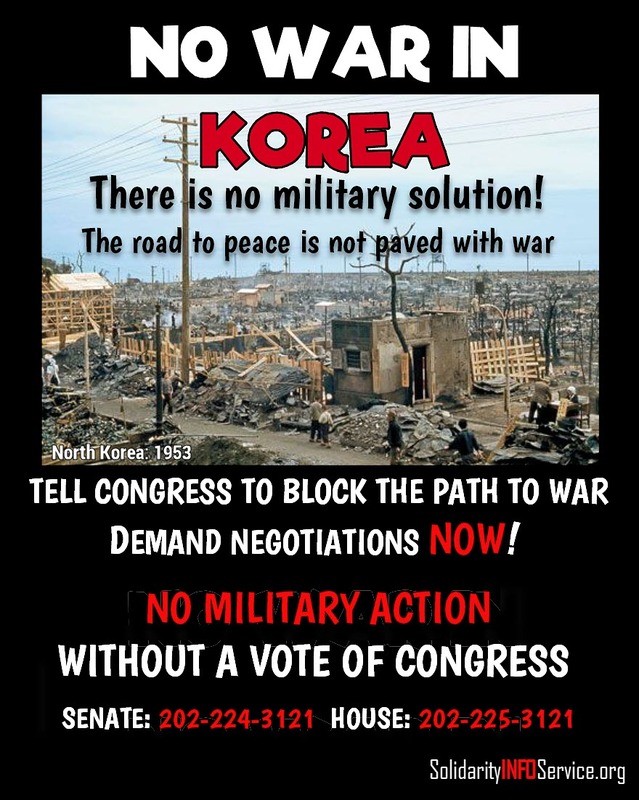 ~ Bruce K. Gagnon is a member of Veterans For Peace. He lives in Bath. Closing statements by Democrats in Augusta yesterday against and in favor of the corporate welfare give-a-way bill (LD 1781) to BIW/GD. Video by Regis Tremblay giving a broad view of our seven-hours of protest at the capital in Augusta yesterday. Thanks to all who were there. Around noon time one of our friends came up to me on the 3rd floor where I was resting before the 1:00 pm Taxation Committee meeting which was to be held on the first floor of the capital. He said the room downstairs is already full with BIW workers. Come to find out BIW bused in a room full of management supervisors and some workers at least two hours in advance and filled up the room so our folks could not get a seat inside the final Work Session of the committee. I refused to go into the 'overflow room' across the hallway from the Taxation Committee and instead sat in the hall with about half our folks during the entire meeting which lasted well over three hours. Our other friends sat in the overflow room and came out now and then and briefed us on the sausage making process that they could hear over a sound system. From the inside of the Taxation Committee meeting room looking out - one of our locked out friends held his sign against the window to make his point. The human spirit can't be shut out. Connie Jenkins (Orono) asked the Taxation co-chairs Sen. Dana Dow and Rep. Ryan Tipping to allow our side to have half the seats in the room before the meeting began. They both refused. 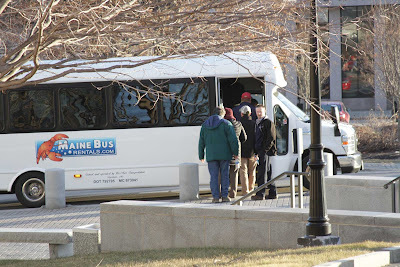 As we were leaving the state house we noticed BIW workers piling onto a bus. One of our friends with us, a former BIW worker who retired after 34 years at the shipyard, said the workers were likely paid overtime for being at the work session. We had 27 opponents gather on the third floor of the State Capital this morning beginning at 9:30. We covered both sides of the hallway in between the House and Senate chambers. We handed out over 100 flyers again to legislators, lobbyists and the public. We stayed up there until about noon when we learned that BIW had bused about 40 people to the Taxation Committee meeting and filled up the room ensuring that we were banished to an overflow room across the hall. On the doors at each room there were notices (the first time we had seen them since we began coming to these meeting during the three previous sessions) directing people to the overflow room. So it is quite clear that this whole charade was well planned in advance between BIW/GD and the legislative committee. During our time on the 3rd floor hallway while the House and Senate were gathering we had several excellent conversations with some legislators who are choosing to oppose the $60 million give-a-way bill to GD - one of the richest corporations on the planet. While there, one of our supporters, a union person in Maine, told us a remarkable story. She reported that she had spoken to a representative from the Machinist Union (S6) at BIW who informed her that they were not going to support the bill. One of their members had read the cover story in the February issue of The Bollard magazine out of Portland entitled Ship of Fools. This blockbuster article was widely distributed throughout southern and midcoast Maine. After reading the story the worker began educating other BIW workers about how GD is loaded with so much cash they are buying back their own stocks driving up market share which primarily benefits top executives and investors. As a result the union Executive Committee voted not to endorse LD 1781. There has been no media coverage of this huge story. This is a big deal for many reasons - primarily because many legislators in Augusta have been hanging their hats on how they are supporting the bill because of the workers - saying that the workers want the bill passed thus they as elected officials must honor their demands. As it turns out there is much, much more to the story. After the long Taxation Committee meeting they voted 9-2 in favor of moving the bill to the floor of the House and Senate. The two votes against were Sen. Justin Chenette (D-Saco) and Rep. Janice Cooper (D-Yarmouth). 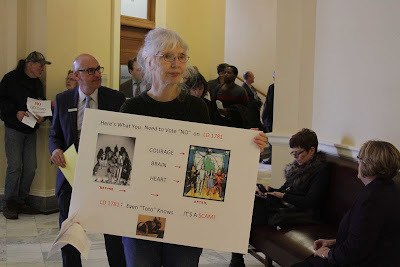 Chenette once again stated that he could not vote for the bill because BIW/GD never proved they really needed the money - they were unwilling to show the committee in closed session their books to prove they were in financial straits. Rep. Cooper talked about the great many social needs across Maine that presently exist and how this $60 million was essentially peanuts to mega-corp GD while to our state these kinds of funds are urgently needed. Rep. Ryan Tipping (D-Orono), who himself was once an organizer for the Maine People's Alliance, weakly stated that he would vote for the bill despite his worries that we are now in a 'race to the bottom'. It's a strange thing to hear someone say that (which is totally correct) and then meekly change course and vote for a bill that will only accelerate that plunge into further poverty and such. 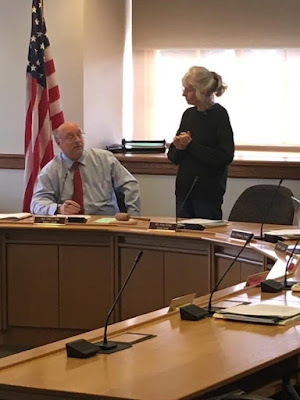 Rep. Denise Tepler (D-Topsham) made the absurd statement that she thought we had ample funds in the state treasury to fund social needs and the corporate welfare bill for GD. All Republicans on the committee voted for the bill. LD 1781 next goes to legislature staff who must insert the final language into the bill which the committee analyst told me should take about two weeks since we are nearing the end of this special session and the backlog of bills needing staff work before they can go to the floor for final votes is growing. My plan is to continue my hunger strike and use this remaining time to help build even greater opposition to LD 1781 in Maine. Working with good folks across the state we will keep asking Mainers to contact their state legislators and to keep writing letters to the editor. I will be going back to Augusta to stand between the House and Senate chambers with my sign next Tuesday and Thursday from 9:30 am to noon. Stop this insane march to war! Standing at the capital in Augusta last week. We are going back on Tuesday (March 6) at 9:30 am to stand in the hallway on the 3rd floor with signs appropriate to defeating LD 1781 and hand out flyers to the legislators as they enter the House and Senate chambers. At 1:00 pm is the Taxation Committee Work Session on the bill (likely the last one) in room 127. We will be there as well. I've been getting lots of messages on email and Facebook and thought I'd share a few with you. One of them is from Connie Jenkins who last week (along with five others) met with her State Rep. Ryan Tipping who is co-chair of the Taxation Committee in Augusta. Rep. Tipping told his constituents in the 90 minute meeting that he thought LD 1781 was a 'bad bill' but because 'leadership' supported the bill he felt he too must support it and was trying to 'make it a better bill'. Connie wrote him this yesterday in anticipation of the Tuesday Taxation Committee Work Session in Augusta (at 1:00 pm in Room 127) that many of us will be attending. As you know, there have been numerous letters, emails, demonstrations, and vigils by citizens throughout the State of Maine who are outraged that people elected to represent us are caving to Party “leaders” and preparing to vote in favor of LD 1781. Following is a recent email I wanted to share with you. It includes coverage of some of the powerful, heartfelt statements at yesterday’s vigil at BIW and a brief “spot-on” summary of the situation we’re in by an emeritus professor of law [Orlando Delogu] at the University of Maine School of Law. Please consider these as you prepare for Tuesday. I plan to be there for the vote and I pray you will vote from principle rather than Party pressure. 1. This legislation was not a legislative carry-over; it was not the product of Legislative committee or Executive office thinking. GD/BIW and its legal lobbyists drafted LD 1781 in early January. It was rammed into the short 2nd session by the leadership in violation of legislative rules. The talking points for sponsors of this LD come directly from these same corporate lobbyists. 2. The legislation talks of preserving jobs, but it allows employment to sink from present levels (approx. 5,500) to below 4,000 and they still get the money. 3. The legislation talks of $100 million of new investment, but defines new investment so broadly that almost all shipbuilding expenses qualify as “new investment.” It assumes we can’t see through this scam. 4. Amendments breaking this tax give-away into two $30 million packages change none of the substantive provisions—GD/BIW still winds up with $60 million in two bites instead of one. 5. The veiled threat that GD/BIW is in a competitive market and may leave Maine if this subsidy is not granted permeates every discussion of LD 1781—IT’S A LIE unless one assumes that GD/BIW is prepared to walk away from a $500 million operating plant, a 10 year backlog of work, a trained work force, and extraordinary profits that will extend far into the future ($3 billion in 2017). COMMON SENSE SAYS NONE OF THIS IS GOING TO HAPPEN. As for competition—BIW and Ingalls have divided navy ship building contracts for decades; they will continue to do so. That’s what the navy wants. 6. In the face of these realities, the hubris of the corporation’s demand for $60 million from relatively poor Maine Taxpayers is best seen in the CEO’s $21 million annual salary, and her boast, “Boeing makes airplanes, GD/BIW makes profits.” Yes they do—obscene profits. In short, Maine needs the $60 million far more than GD/BIW. Every fact cries out for a NO vote on LD 1781, or a veto by the Governor who continually touts his fiscal responsibility. If our political leaders can’t find the courage to say NO, a people’s veto is surely in order. ~ Orlando Delogu of Portland is emeritus professor of law at the University of Maine School of Law and a longtime public policy consultant to federal, state, and local government agencies and officials.